Now you can stop worrying about the hair loss that you might have been experiencing recently because Nu Hair Clinic has opened a branch close to you at Newcastle. So now you don’t need to get tensed about you hair and lose your night’s sleep. You can solve all your hair problems by vising our clinic by way of an appointment. 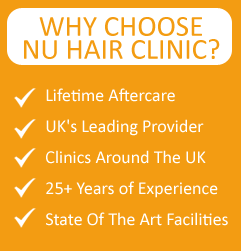 We at Nu Hair Clinic care for your hair more than you do! We have associated with us some of the best doctors in the world who are specialized in Hair Treatment. They provide the best possible treatments that are custom made for you. We believe that each hair problem is different and must be addressed in a unique manner. The techniques used by our doctors meet the industry standards and have been producing good results that have made millions of people happy. We have eradicated the hair woes of many people and they have shown positive results after the Hair Transplant for men women Newcastle. We are trying to include solutions to address the hair related problems of women. We are trying to bring in innovative methods of repairing the hair problems of women. One such new entrant to our portfolio is Eyebrow Transplant. Let us discuss about it in detail. Eyebrow transplant has been becoming more popular among women these days. We at Nu Hair Clinic are offering Eyebrow transplant using techniques such as FUE and Mesotherapy to make your eyebrows bigger and fuller in nature. Our doctors have devised superior methods and techniques that are being incorporated to bring you the best treatments of Hair Transplant for men women Newcastle. Nowadays many people, especially women are suffering from eyebrow disorders. Some people do not have a good growth of their eyebrows. This is one reason of not having a good looking eyebrow. Vogue over plucking, ageing and genetics are some other reasons of not having healthy eyebrows. Over plucking can permanently damage hair follicles in the eyebrows and can restrict further growth. Some people might have natural thinning or hereditary loss or loss due to ageing. Eyebrow restoration can involve two procedures; one is Follicular Unit Extraction or Mesotherapy. During a Follicular Unit Extraction the donor area is to be identified at first. Usually the donor area for an eyebrow restoration is the area behind the ears. The hair is taken out discreetly and carefully; one follicle at a time and transplanted onto the transplant area. The operation is performed under local anesthesia. Mesotherapy is also a good treatment to restore bleak eyebrows. Mesotherapy involves usage of lotions and solutions that help in stimulating the eyebrows to regenerate hair in the eyebrows. Mesotherapy is a slow and continuous process but is much less risky than a Follicular Unit Extraction. It is generally applied if hair loss is detected at an early stage. So stop worrying and start acting today. Book an appointment with any of our doctors at the Nu Hair Clinic and treat your eyebrow soon.